Travel to Georgia and enjoy five nights appreciating its mix of breathtaking natural beauty, timeless regions steeped in history and traditions, and ever-charming effervescence and hospitality of locals. With every facet of your holidays flawlessly taken care of, you can completely devote yourselves on discovering the country’s celebrated culture and heritage. 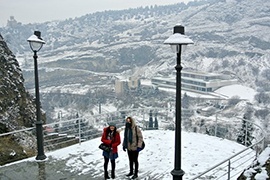 Explore the fascinating tale of Georgia’s old and new capital cities on Tbilisi – Mtskheta City Tour. In the present day capital of Tbilisi, you’ll tour the incredible Holy Trinity Cathedral, Metekhi Church of 13th century, Narikala Fortress offering the most striking views, Sioni Cathedral, and Rezo Gabriadze Theatre – a marionette theatre, among others. Alternatively, Mtskheta’s impressive landscape will captivate you with its UNESCO World Heritage attractions by way of Jvari Monastery and Svetitskhoveli Cathedral. 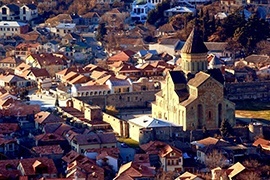 Marvel at more than 8000 years of Georgian viticulture and history as you make a trip to Kakheti wine country. Wander through the extensively lush vineyards, learn about the traditional wine producing technique using Qvevri, and sip the real organic Georgian wines. Bodbe Monastery with the tomb of the highly venerated St. Nino and Sighnaghi, boasting the remnants of an 18th century fortress, also form part of your Kakheti tour. Moreover, you’ll get to taste the renowned Borjomi natural spring water on your day trip to Borjomi National Park, which further pairs a visit to the enigmatic 12th century cave town of Vardzia. 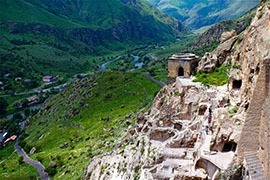 For those who wish to incorporate some fun and action, the major draw of this holiday is Kazbegi Tour. It lets you immerse in the majestic charm of one of Georgia’s largest mountains while giving you the opportunity to enjoy many activities like horse ride, skiing etc. at Gudauri Ski Resort. Excellent service from Miss Bhavana (Dubai) and Miss Martia (Tbilisi). It was a nice experience. We enjoyed a lot.